Every January, people make New Year’s resolutions to save more, pay off debt and just become more organized with their finances. While those are worthwhile – and achievable – goals, without a specific plan of action, it’s hard to make them stick. 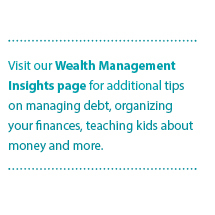 This month’s Wealth Management Insights offers some guidance on how to turn your New Year’s financial resolutions into real change. To save more, play the role of detective. Set aside time to take a close look at your monthly bank statement. Check for spending patterns and opportunities to trim or eliminate nonessential expenses. It’s hard to spend money you don’t have. Look into automatic payroll deductions that can deposit a portion of your paycheck into a savings account without any additional action on your part. If you need a goal to strive for, try to save 3–6 months of living expenses, so if there’s an unexpected bill or financial catastrophe, you’ll be able to handle it. To pay off debt, think strategically. Track your loans so you know exactly what you owe, including the source, balance, interest rate and fees. Pay down debt with the higher interest rates first – usually credit card debt or cash advance loans. Once you pay one debt off, “snowball” your payments by taking the money you would have spent and redirecting it to another loan. If you can, pay more than the monthly minimum payment on any debt. The extra amount will reduce the interest you’ll pay and retire the debt sooner. To get your finances in order, get proactive. While your life can go in all sorts of unexpected directions, your insurance and estate plans will stay the same until you decide to update them. Review them periodically, especially after a major life event like a marriage, divorce, birth or death in the family. Keep a folder of tax-related paperwork as it comes in throughout the year. You’ll be glad you did when it’s time to file your returns and your paperwork is already in order. Protect your financial life by signing up for credit or identity theft monitoring. An extra set of eyes could catch a potential issue before it becomes an urgent problem. The best way to keep your New Year’s financial resolutions is by taking small, meaningful steps that build into habits. Your Baird Financial Advisor can help you implement everyday strategies that over time can improve your bottom line.